The heart of this comic is in the depiction of the budding teen romance between the two leads. The artist does not overwhelm you with mush, ultra-flowery backgrounds, or corny dialogue. Instead, she makes you subtly fall in love with each protagonist with just a fleeting look or a simple kind word. You will go for pages just reading a goofy comedy about school kids working a part time job, and then bam! Sakamoto hits you with a panel that will make you coo out, “Aww!” and smile. And you actually do end up falling in love with the characters because they are awkward but caring teenagers. Shinobu is your average ordinary girl with nothing really that interesting about her, and Miharu very rarely shows any signs of being a “leading man” by any definition. But they both easily look past each other’s quirks and simply find a cute and kind partner in front of them, and I found this to just perfectly capture the essence of teen love into comic book form. If I had to say anything bad about this comic, it would have to be in the visual department. The character designs are just plane ugly. The girl’s face is far too round and always seems to have a bewildered look going on. The lead man is even worst by being far too angular and skinny. The artist fails to make him come off as mean or intimidating when he’s supposed to be, nor kind and cute during the sentimental moments. 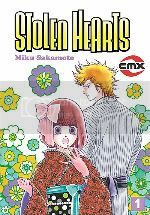 But besides for that, the one thing that really surprised me about Stolen Hearts was just how funny it ended up being. I think that CMX Manga’s translator on this book, Sheldon Drzka, is owed a lot a credit for this. Humor is the hardest thing to translate between Japanese and English, and most manga adaptations fail to do it. But Drzka’s natural sounding dialogue makes the text flow more smoothly for the English reader to take in all of the humor. His knack for arranging great comedic timing within the established word bubbles will ensure that you’ll be chuckling through out this entire volume. The Good: A sweet and heartwarming love story that wonderfully captures the joy of teen romance. Very funny comedy back by a great English adaptation. The Bad: Ugly character designs, especially with the male lead. Final Verdict: Stolen Hearts is a romantic comedy and fully delivers on the romance and the comedy. Read it! This entry was posted on Thursday, February 4th, 2010 at 1:58 pm by Scott	.